Chicago is often known for two things: The violence and government corruption. At least that’s what most non-Chicagoans say when I remind them that I’ve lived in Chicago for ten years. Fortunately, this week the world took note that even in Chicago the underdog can succeed. The best part is that these underdogs are kids coming from the south side of Chicago – a place often highlighted in the news when discussing violence in America. I’m not a baseball fan. Honestly, I’ve lived both on the north and south side of Chicago, and so I’ve found it hard to choose between the White Sox and the Chicago Cubs. I’ve also had a love hate relationship with Chicago, and often find myself questioning my move ten years ago when I decided to come here for college. It is hard to live in Chicago without having been scared by the crime. So, when the Jackie Robinson West team got closer to winning the Little League Championship I jumped on board as a fan. This is not because I suddenly became a baseball fan, or that they had turned into an overnight sensation. It’s because I realized their ability to bring the city together. It’s the first time in a long time that I witnessed the old, young, Sox fan, Cubs fan, white, black, poor and rich rallying behind a group of kids that really just wanted to play baseball. What makes the Jackie Robinson West team’s path to being United States Champions so heartwarming is the humbleness of the players and the coaches. Perhaps it is their inability to fathom the magnitude of such a win, or the lingering childishness that remains with age. What ever it is, Jackie Robinson would be proud. 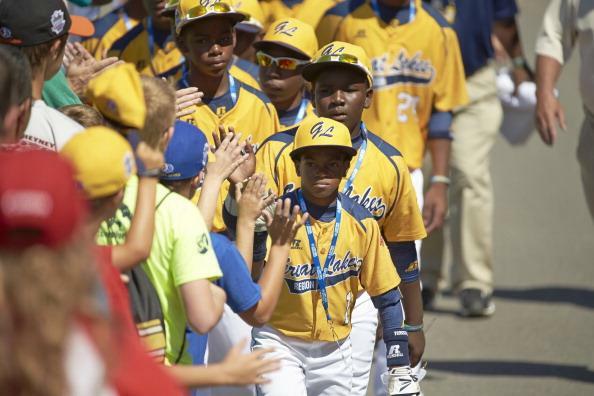 The Jackie Robinson West team signifies a new generation of struggle- to be relevant when so much is against you. Like many of the unspoken kids in Chicago they give a positive face to a backdrop filled with misery and despair… They give hope. I was reminded of the discrimination Jackie Robinson went through as the first African American to play Major League baseball and the legacy this team was continuing by focusing first on their talent as baseball players. Even though they did not win the Little League World Series, they won the hearts of America. Much like Jackie Robinson reminded us that race does not define your success; they reminded us that where you’re from does not define your talent. Hopefully, with this new perspective Chicagoans will find other ways to come together and care for the talents of kids such as those of our U.S. Champions Jackie Robinson West. In doing so we will find talent in all professions living on the south side of Chicago. We will find ways to honor the lives of such greats as Jackie Robinson, and continue the legacy of equality for all. Now, that would be something to be proud of. Previous PostWhat Happened to #BringBackOurGirls?Next PostWhy Haven’t You Asked Me To Take The #IceBucketChallenge? Well said Philister. Great article. Thank you Uncle! I’m glad you enjoyed this post, obviously I’m very proud of this Chicago team.